Facebook made headlines this week when it acquired WhatsApp for a staggering $19 billion in cash and stock. WhatsApp has become an extremely popular mobile messaging application internationally, brining over 450 million monthly active users with it to Facebook. This acquisition is a preemptive strike from Facebook to dominate the mobile messaging environment, jumping on the young tech company before Google and Microsoft could get their hands on it (although there are reports that Google had put in a $10 billion bid for WhatsApp, which was ultimately rejected). What does Facebook get with the acquisition of its new crown jewel? In addition to owning one of the most successful platforms for mobile messaging, WhatsApp has quickly becoming one of the fastest growing companies in terms of active users, increasing it’s active user based by over 200 million in just 10 short months. While Instagram and Snapchat have been considered impressive social applications over the past year, the amount of media shared on both is trumped by WhatsApp, with users sending over 50 billion messages per day on the aforementioned messaging application. It’s obvious that Facebook paid a heavy price not just for the technology, but for the significant amount of activity generated by users within the application. 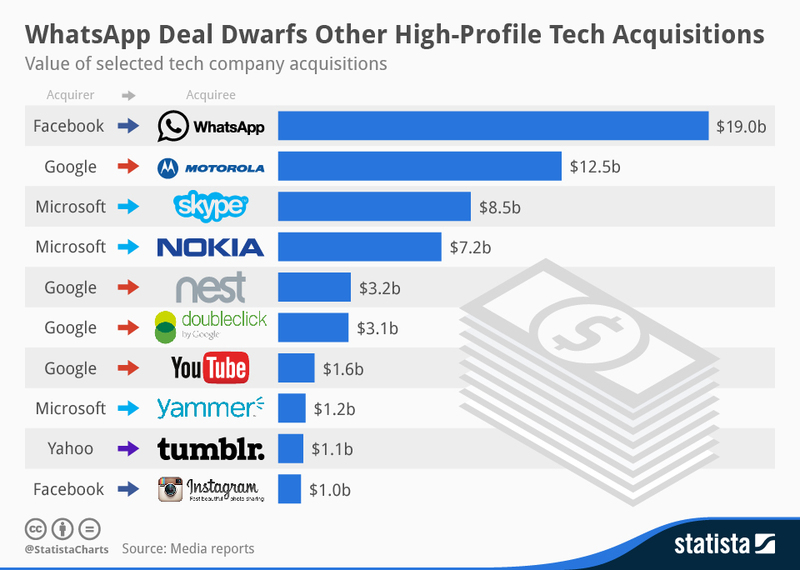 Compared to recent tech deals, WhatsApp is clearly ahead of the pack (see Statista’s chart below), dwarfing other high-profile acquisitions made by Google, Microsoft, Yahoo, and yes, even Facebook (Instagram is no longer the teacher’s favourite student). How the application will be integrated within Facebook’s suite of products remains to be seen. Facebook maintains that it will not integrate WhatsApp with its own Messenger application, but that just may be a statement to appease users and not scare them away. However, with the high engagement and staggering amount of active users utilizing the messaging application, there is no doubting that this acquisition, while costly, looks to be a win for Facebook….for now.